Home > Arts > Did Artists Lead the Way in Mathematics? 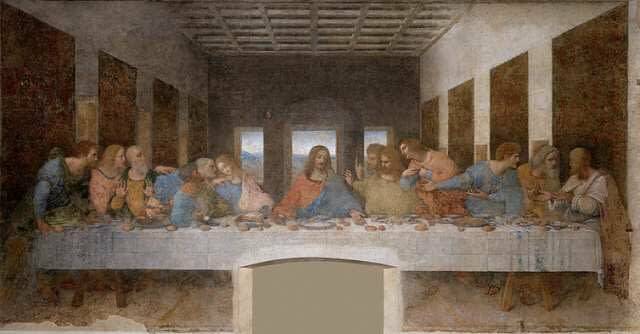 Is there a geometry lesson hidden in ‘The Last Supper’? Mathematics and art are generally viewed as very different disciplines – one devoted to abstract thought, the other to feeling. But sometimes the parallels between the two are uncanny. From Islamic tiling to the chaotic patterns of Jackson Pollock, we can see remarkable similarities between art and the mathematical research that follows it. The two modes of thinking are not exactly the same, but, in interesting ways, often one seems to foreshadow the other. Does art sometimes spur mathematical discovery? There’s no simple answer to this question, but in some instances it seems very likely. Consider Islamic ornament, such as that found in the Alhambra in Granada, Spain. In the 14th and 15th centuries, the Alhambra served as the palace and harem of the Berber monarchs. For many visitors, it’s a setting as close to paradise as anything on earth: a series of open courtyards with fountains, surrounded by arcades that provide shelter and shade. The ceilings are molded in elaborate geometric patterns that resemble stalactites. The crowning glory is the ornament in colorful tile on the surrounding walls, which dazzles the eye in a hypnotic way that’s strangely blissful. In a fashion akin to music, the patterns lift the onlooker into an almost out-of-body state, a sort of heavenly rapture. It’s a triumph of art – and of mathematical reasoning. The ornament explores a branch of mathematics known as tiling, which seeks to fill a space completely with regular geometric patterns. Math shows that a flat surface can be regularly covered by symmetric shapes with three, four and six sides, but not with shapes of five sides. It’s also possible to combine different shapes, using triangular, square and hexagonal tiles to fill a space completely. The Alhambra revels in elaborate combinations of this sort, which are hard to see as stable rather than in motion. They seem to spin before our eyes. They trigger our brain into action and, as we look, we arrange and rearrange their patterns in different configurations. An emotional experience? Very much so. But what’s fascinating about such Islamic tilings is that the work of anonymous artists and craftsmen also displays a near-perfect mastery of mathematical logic. Mathematicians have identified 17 types of symmetry: bilateral symmetry, rotational symmetry and so forth. 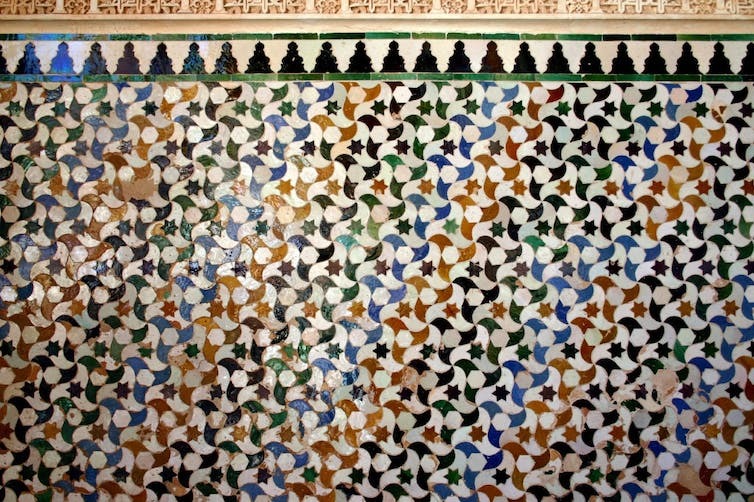 At least 16 appear in the tilework of the Alhambra, almost as if they were textbook diagrams. The patterns are not merely beautiful, but mathematically rigorous as well. They explore the fundamental characteristics of symmetry in a surprisingly complete way. Mathematicians, however, did not come up with their analysis of the principles of symmetry until several centuries after the tiles of the Alhambra had been set in place. Stunning as they are, the decorations of the Alhambra may have been surpassed by a masterpiece in Persia. There, in 1453, anonymous craftsmen at the Darbi-I Imam shrine in Isfahan discovered quasicrystalline patterns. 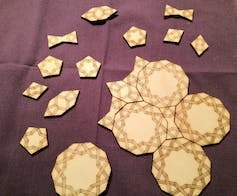 These patterns have complex and mysterious mathematical properties that were not analyzed by mathematicians until the discovery of Penrose tilings in the 1970s. Such patterns fill a space completely with regular shapes, but in a configuration which never repeats itself – indeed, is infinitely nonrepeated – although the mathematical constant known as the Golden Section occurs over and over again. Daniel Schectman won the 2001 Nobel Prize for the discovery of quasicrystals, which obey this law of organization. This breakthrough forced scientists to reconsider their conception of the very nature of matter. In 2005, Harvard physicist Peter James Lu showed that it’s possible to generate such quasicrystalline patterns relatively easily using girih tiles. Girih tiles combine several pure geometric shapes into five patterns: a regular decagon, an irregular hexagon, a bow tie, a rhombus and a regular pentagon. Whatever the method, it’s clear that the quasicrystalline patterns at Darbi-I Imam were created by craftsmen without advanced training in mathematics. It took several more centuries for mathematicians to analyze and articulate what they were doing. In other words, intuition preceded full understanding. Geometric perspective made it possible to portray the visible world with a new verisimilitude and accuracy, creating an artistic revolution in the Italian Renaissance. One could argue that perspective also led to a major reexamination of the fundamental laws of mathematics. According to Euclidian mathematics, two parallel lines will remain parallel into infinity and never meet. 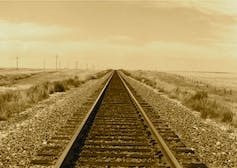 In the world of Renaissance perspective, however, parallel lines eventually do meet in the far distance at the so-called “vanishing point.” In other words, Renaissance perspective present a geometry which follows regular mathematical laws, but is non-Euclidian. When mathematicians first devised non-Euclidian mathematics in the early 19th century, they imagined a world in which parallel lines meet at infinity. The geometry they explored was, in many ways, similar to that of Renaissance perspective. Non-Euclidian mathematics has since moved on to explore space which has 12 or 13 dimensions, far outside the world of Renaissance perspective. But it’s worth asking whether Renaissance art may have made easier to make that initial leap. An interesting modern case of art that broke traditional boundaries – and that has suggestive parallels with recent developments in mathematics – is that of the paintings of Jackson Pollock. 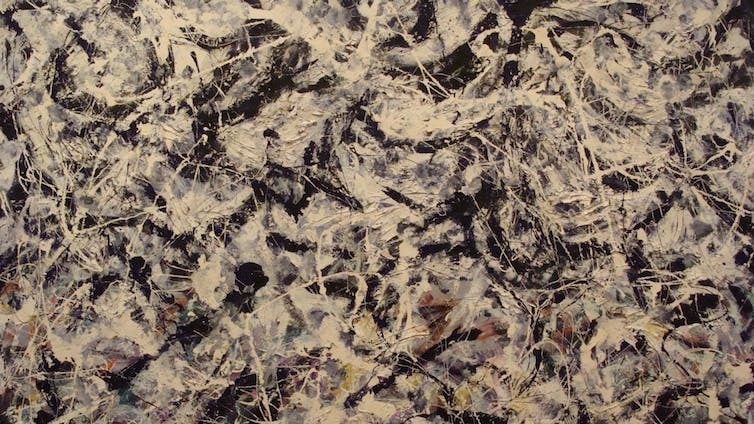 To those who first encountered them, the paintings of Pollock seemed chaotic and senseless. With time, however, we’ve come to see that they have elements of order, though not a traditional sort. Their shapes are simultaneously predictable and unpredictable, in a fashion similar to the pattern of dripping water from a faucet. There’s no way to predict the exact effect of the next drip. But, if we chart the pattern of drips, we find that they fall within a zone that has a clear shape and boundaries. ‘Greyed Rainbow’ by Jackson Pollock. Such unpredictability was once out of bounds for mathematicians. But, in recent years, it has become one of the hottest areas of mathematical exploration. For example, chaos theory explores patterns that are not predictable but fall within a definable range of possibilities, while fractal analysis studies shapes that are similar but not identical. Pollock himself had no particular interest in mathematics, and little known talent in that arena. His fascination with these forms was intuitive and subjective. Intriguingly, mathematicians have not been able to accurately describe what Pollock was doing in his paintings. For example, there have been attempts to use fractal analysis to create a numerical “signature” of his style, but so far the method has not worked – we can’t mathematically distinguish Pollock’s autograph work from bad imitations. Even the notion that Pollock employed fractal thoughts is probably incorrect. Nonetheless, Pollock’s simultaneously chaotic and orderly patterns have suggested a fruitful direction for mathematics. At some point, it may well be possible to describe what Pollock was doing with mathematical tools, and artists will have to move on and mark out a new frontier to explore.